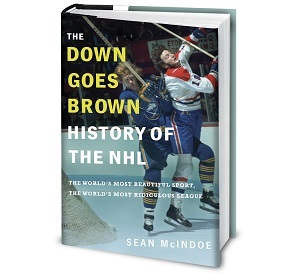 Down Goes Brown: Weekend wrap: Which teams were we wrong about? Well, that didn’t go well for the Canadiens. Fresh off the embarrassment of becoming the first team in the league to lose to the Coyotes in regulation, the Habs had a chance at instant redemption in a home matchup against the Maple Leafs. Instead, they suffered through a third-period implosion on the way to a 6–0 loss that may have somehow been even more embarrassing. So now what? The Canadiens are 21 games into their season, and it already feels like the drama around this team is exhausting. They started slow, including a stretch where nobody could score. But they seemed to have turned things around, winning six of eight while scoring five or more four times. They still had ground to make up, but the percentages were evening out and it felt like it was OK to sound the all-clear on any talk of disaster. Maybe not. The Habs have now lost four of five, sinking back down to five points out of a playoff spot. GM Marc Bergevin is taking all sorts of heat. Max Pacioretty is getting his usual share of the blame. And now there’s even talk that the team could be doing some “soul searching” while considering starting all over with a rebuild. That’s a long-term decision and any problems with this roster didn’t just appear overnight, but it’s amazing how much one rotten week can change the perception of a team. The Canadiens aren’t the only team being reevaluated right now. Half the teams in the league have now hit the 20-game mark, which means it’s time to do a few important things. First, we can spend the next few days referring to this point in the season as the “quarter pole” just so that the sort of people who enjoy giving lectures on proper horse-racing etymology will have something to do. And second, we can start in with some serious re-evaluation of the teams we may have been wrong about. Every year, a few teams we thought would be good stumble through the season’s first month while a few teams we’d already written off look like playoff contenders. Those are interesting stories, and we’ve covered plenty of them in this space over the last few weeks. But as we’re constantly reminded, it’s still early, and a small handful of games can’t tell us all that much. But 20 games is… well, it’s still a relatively small sample, and it’s not unheard of for a team to have a good or bad stretch for a quarter of a season that still turns out to be an outlier. But we’re reaching the point where it’s time to start taking the standings seriously, if only because teams may have built up a cushion or deficit big enough to survive a correction down the line. So this week, let’s pick three teams that most of us thought would be good and three teams we all assumed would be bad but who aren’t following the script, and ask: Were we wrong? And if so, what does that mean going forward? We’ll tackle the disappointing teams in our Cup section and the surprising teams in our lottery section. For some of them, based on the first 20 games, it may be the last time they get mentioned in those sections this year. And of course, we’ll also dive into the teams that have been truly good and truly awful in our weekly power rankings. Speaking of which, you’ll never guess who’s sitting in the No. 1 spot in our top five. 5. Winnipeg Jets (12-4-3, +12 true goals differential*): The Jets make their debut on the strength of a four-game win streak. They’ll be tested this week as they head to Nashville tonight and then onto a three-game California road trip.